I mentioned last week that it had been a year of the Creatively Crafty Link Party, and this week we are celebrating our second year with a little contest for you. The person whose post gets the most clicks (from any of the co-hosts) this week will receive $20 from us as a way to thank you for participating and sharing our linky. We truly appreciate those of you who share your posts, spread the word about the linky and visit each other’s pages. There’s nothing strictly Valentine’s Day about thumbprint cookies, but these strawberry jam cookies from 3 Winks Design would be great for the upcoming holiday. Or, you know, tomorrow. Or the next time you’re having a tea party. These heart treat bags made out of old maps from Pillar Box Blue are adorable and a sweet (ha!) way to package a little candy or another small treat for Valentine’s or any other time. They also use a fun technique I love, which is sewing on paper. The bag concept is great, but wouldn’t this also be cool as a garland? I’ll bet everyone has a bookcase in their house (or more than one) that just isn’t all that attractive. 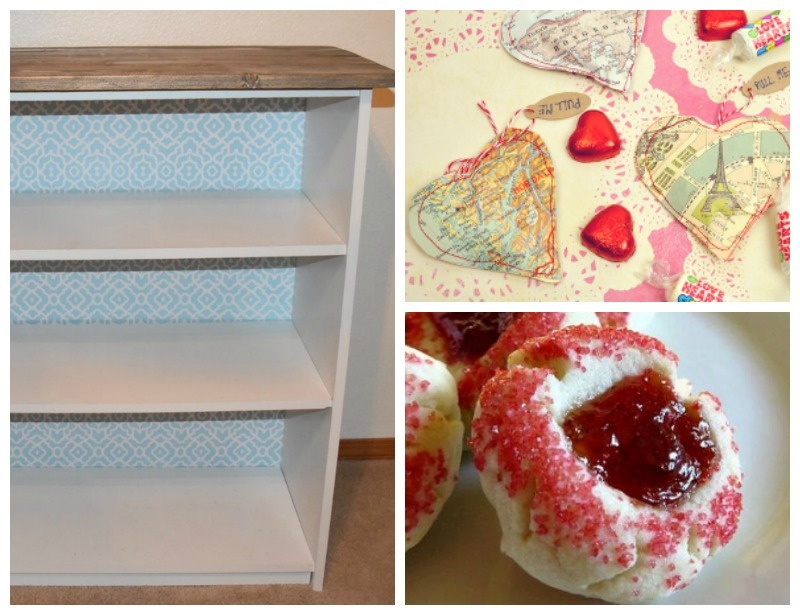 Find It, Fix It or Build It has a great solution for dressing up an old bookcase with patterned paper, paint and a few boards. It’s so cute and you can do this even if you don’t consider yourself very handy.